Ask many well-traveled Greeks and Philhellenes what their favorite Greek island is and you will get a number of responses. 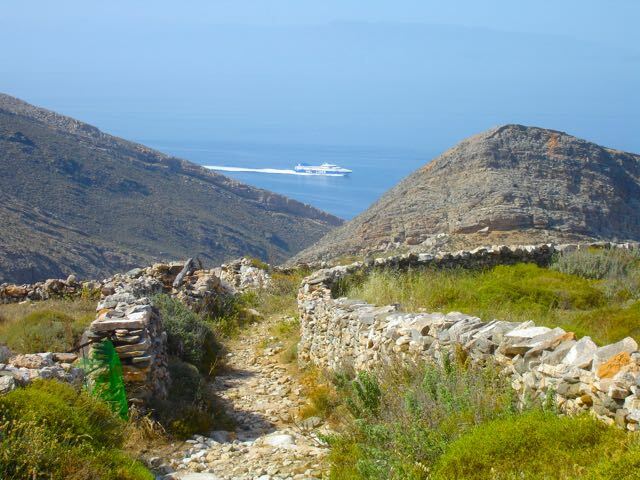 Sifnos, Tinos, Lesvos, Chios, Milos are some of the off-the-beaten-path islands that go along with the popular ones like Rhodes, Santorini and Mykonos which the tourists all praise, (mainly because those are the only islands they have been to). But lovers of the elusive 'real Greece' pretty much all agree that the island of Syros is a special place. The town of Hermoupolis is the capital of the Cyclades and one of the most architecturally fascinating ports in the Mediterranean, a living museum with some of the most beautiful old buildings in Greece and one of the most cosmopolitan towns in the Greek islands. Hermoupolis means 'City of Hermes' and as we all know, Hermes was the God of Commerce. The island was not an important center in antiquity. But from the Ottoman period until the 19th Century the importance of the island grew, first as a center for Latin Church (Syros, like Tinos and Naxos has a large Catholic population), and during the War for Greek Independence when refugees from Chios, Psara and Asia Minor escaped the destruction of their towns and built Hermoupolis, which quickly became the primary port of Greece. At its peak the population reached 14,000 and the city was home to the oldest high school in Greece, another famous private school of art and culture called The Lykeion, one of the first post offices in Greece, a hospital, an opera house, a municipal orchestra, a Jesuit Monastery, an orphanage, a sanitarium, the historical Neorion Shipyards, a cemetery that rivals Athens 1st Cemetery, and perhaps the most impressive collection of 19th century architecture of any town in Greece, certainly in the islands. Syros is on the same ferry line as Mykonos and Tinos which means there are a lot of boats in the summer and even several a day in the off-season. Because it is the capital of the Cyclades and the courts and regional offices are here, it is the one island that has a ferry connection from all the other Cyclades islands. Maybe not every day, in fact with some maybe only once a week. 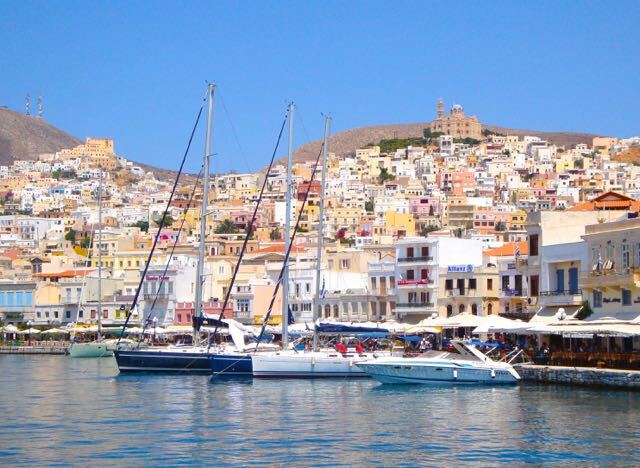 But if you plan your trip well you can include Syros in combination with any of the islands and use it as your connection island, staying there as few or as many days as you need to catch your connecting ferry. 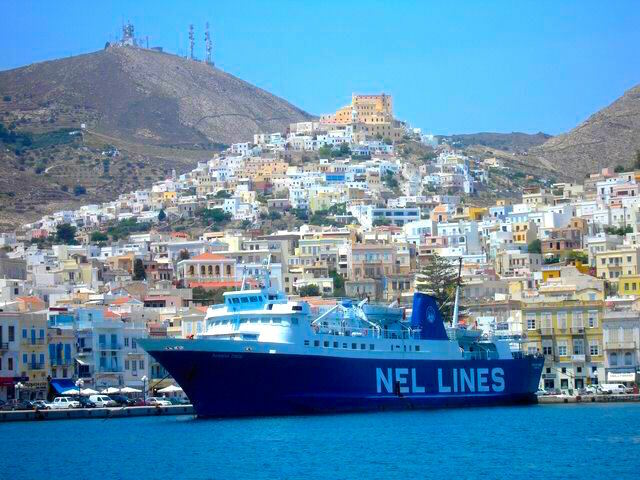 While most ferry boats do the same run to the same two or three islands every day, the Syros ferries do a different route every week, going to the furthest and most remote of the Cyclades and connecting the island with the mainland at Lavrion. Syros is also a stop for some of the ferries going to Ikaria and Samos and even Patmos and the Dodecanessos islands one or two times a week. In the summertime when ferry connections to Santorini are more regular, people doing sailboat charters will make Syros their least stop and take the ferry to Santorini to spend a few days there. (Santorini is a long trip by sailboat and does not have the best harbor). To make life even easier for those doing business here, there is also an airport. Restaurants in Syros are a notch or two above Mykonos in quality and a notch or two below in price. You get better food for less. Why? One reason is because it's a capital city with a year-round population which means restaurants are reliant on return customers. So if they don't serve good food people won't come back. Syros also has a history of good food since many of the locals are descended from refugees from Asia Minor. In fact the port of Hermoupolis bears an eerie resemblance to the old postcards of pre-1922 Smyrna. Several loukoumia shops which trace their roots back to the Ionian Greeks dot the harbor street. 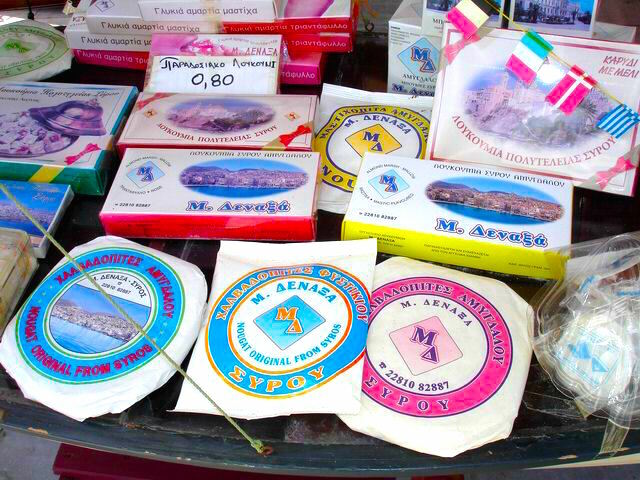 Loukoumia is a sweet, gummy, desert that has the texture of a dried jellyfish and is a primary export of Syros. You can't come to Syros without trying loukoumia which you don't even have to get off the boat to buy. When ferries arrive men with baskets of loukoumia rush on board to sell to the tourists on their way to Mykonos or Pireaus. They also sell a sweet called nougat which is a dried sugary wafer thing, sort of like flat white peanut-brittle without the peanuts, if that gives you a clear picture. Actually it is more like sun-dried toothpaste in appearance and texture, but it happens to be really delicious. My favorite restaurants include our old standby, the Yaninea, a combination psistaria-estiatorio which serves a variety of grilled meats and oven cooked meat, fish and vegetables and even a few pasta dishes. In a pinch it's a good place for an ouzo and meze though true ouzofiles will go to the tiny Nisiotissa Cafeneon on the narrowest side street you can find leading up from the port, a block or so away from the Hotel Hermes where you can get a hefty mezedes in the afternoon or evening and strapatsada (scrambled eggs with tomatoes, peppers and feta cheese) with your coffee at breakfast. During hot sultry nights there is nowhere better than the air-conditioned Amvix Italian Restaurant, right across from there the ferries come in, a great first stop if you arrive on an evening boat. Its also one of the best Italian restaurants in Greece. Karafo Tsakismata is a taverna-mezodopoulio on the waterfront where you can sit for hours eating, drinking and singing with the musicians that seem to show up there, whether by chance or for pay, I don't know. Michalis Ouzeri is just one of the many waterfront hangouts where the old men who fill the seats by day give way to the younger crowd at night. The waterfront of Hermoupolis is one of the best spots for people and boat watching in the morning, when you can drink coffee and espresso and breakfast on yogurt with fresh fruit, honey and nuts, while reading the International NY Times or any of several dozen foreign papers which arrive on the first boat from Pireaus at 11am. From the early evening the cafes fill up with locals, and visitors, drinking frappes and fredos, or sipping on ouzo, or chugging beers before hitting the backstreets where there are a number of small traditional tavernas and hip bistros. After dinner many return to cafes to talk or on occasion to listen to live jazz until morning like my daughter did, (the same day she got her nose pierced in the tattoo parlor by Maioulis Square). Hermoupolis is crowned by two churches on two competing hills (mountains actually). 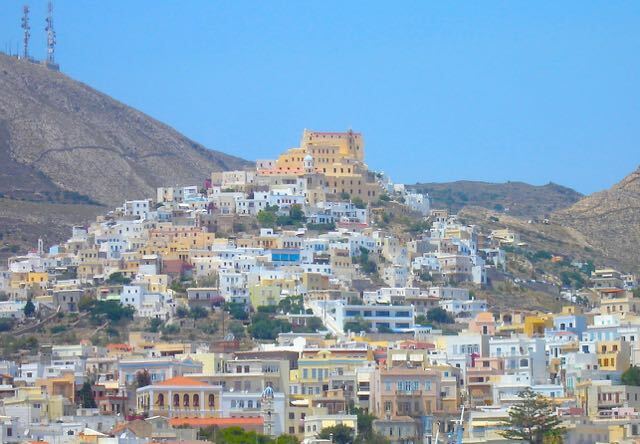 One is the Catholic Hill of Ano Syros with its Metropolitan of Saint George, a 3 aisle basilica with marble floors and a sculptured alter from the nearby island of Tinos, which also has a sizable Catholic community. Next door in the building that once was the Seminary is the Historical Archive of the Catholic Diocese and houses manuscripts from the earliest Christian period. Another critical stop is the Markos Vamvakaris Museum. Vamvakaris was one of the most prolific and some say the greatest of the Rembetika musicians if you take into account the majority of Tsitsanis songs were really laika, not rembetika. Vamvakaris, or you can just say 'Markos' and everyone in Greece will know who you mean, came from Syros to Athens somewhere around 1922, playing in the back street cafes (tekedes), smoking hash, chasing women and singing about poverty, drugs, prison, evil women, heartache, and most famously his song Frankosyriani, (the Catholic Girl from Syros, a love song, which is almost a roadmap of the island. You can hear the song and read the lyrics by clicking on the link). The term Frango is used by Greeks when referring to Roman Christians because the Franks had dominated Europe from the fifth to the ninth centuries and pretty much anyone who came from western Europe was considered by Greeks and Muslims to be a Frank. Its quite a climb to Ano Syros but you can do it if you are young and don't have a heart condition. We drove. Ano Syros is a community of narrow winding streets, mostly steps, small shops, tavernas, cafes and has a completely different feel from the city below. It had been the main town on the island before the building of Hermoupolis in the early 19th Century. The other hill is called Anastassi which is the Orthodox Church of the Resurrection, accessible by car and also worth the trip. Down below there is a lot to see in the town of Hermopoulis, from the beautiful Apollon Opera House, a copy of La Skala in Milan, to Platia Maoulis, one of the largest and most active central squares in Greece, surrounded by 19th century arcaded buildings and the enormous town hall(photo), built by the architect Ziller in 1876 which contains the courts, offices, a gallery and a small cafe inside. The Archaeological Museum is in the western side of the building on Benaki street and contains pieces from Neolithic times up to the Roman period. At one end of the square is an outdoor movie theater which shows films, mostly in English with Greek subtitles. The square is surrounded by cafes, ouzeries, a sandwich shop, the National Bank of Greece and the Pantheon Live Piano Bar. The Church of the Metamorphisis was founded by refugees from Chios in 1824 and is the oldest church on the island and the home of the Metropolitan of the Cyclades. Its a three aisle basilica with a large courtyard with pebbled mosaics. The Church of the Assumption, built by the refugees who came to Syros from the island of Psara has an icon by Domenico Theotokopoulos, also known as El Greco which probably was brought here by the Venetians in the 19th century. For those who have visited Athens First Cemetery and been impressed by the marble mausoleums and sculptures, the Cemetery of Syros is also worth a visit. Many of the tombstones and family grave sites are works of art, spanning the last two centuries, and contain works by some of Greece's first architects. The mansions of the Vaporia district which were built when Syros was in its prime as the primary port in Greece during the late 1800s have been or are being restored, some converted into guest houses and some are still homes. They surround the impressive cathedral of Agios Nikolaos, built in 1848, and overlook the sea where you can swim off the stone platforms below them. The houses are adorned inside with wall frescoes and color decorated ceilings. (If you go into the sunglasses shop in the port they may offer you a short tour of the residence above, the home of a dentist.) The last time we visited Syros the Hermes Hotel was booked so we went to the Syrou Melathron, a beautiful hotel, like a B&B that was in one of these 19th century historical mansions, located right above the stone platforms where people swim. 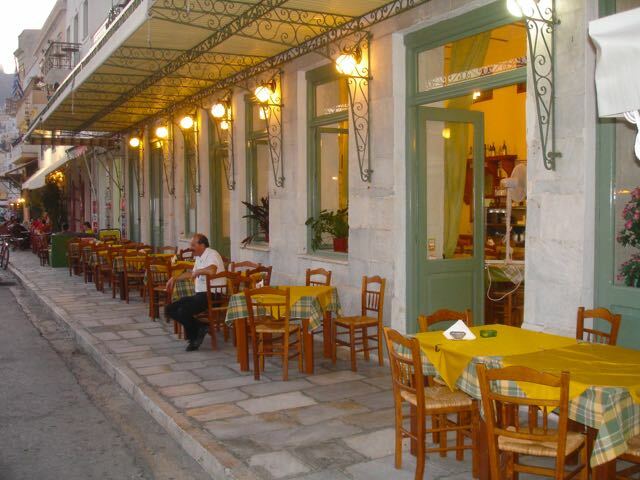 In the same neighborhood, also in an historical mansion are the Archontiko Ermoupolis and the Arion Hotel. The Veranda of Syros Apartments and the Hotel Helectra may not be in historic neao-classical mansions but they are nice hotels with spectacular views. One of the most interesting and lively places to visit is the agora (marketplace), especially in the morning. There are fruits and vegetable shops, fresh fish, and bakeries with fresh baked bread, cookies and cakes. Check out the Prekas Traditional Shop which sells local products like capers, sun-dried tomatoes, cheeses, dried figs, marinated artichokes, loukoumia, nougat, local honey, olives, pasta, oil, local spirits, wine, herbs and candies. Its the closest thing to a natural foods shop and in many ways better. Its on Venizelou Street just down from Maoulis Square. The Methypnevmatopoleio En Syro in the waterfront is known for the old mural that used to decorate the taverna that occupied the building 50 years ago of a pee-ing into the water and the words : Drink Wine. The Water is Dirty. The shop is now a Cava selling wine and ouzo by the bottle. 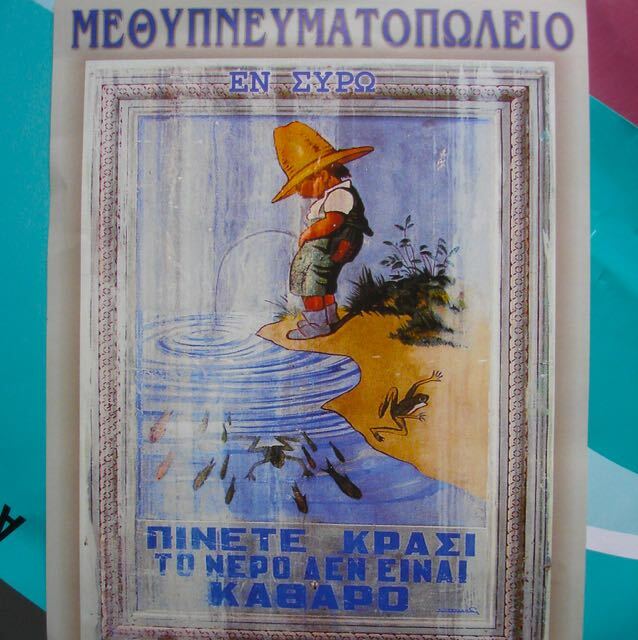 When I went into the shop I asked the owner, Mr Bixos, if he remembered a fish taverna that used to be there that we used to go to with my parents when we first came to Syros in 1963 that had a mural of a boy peeing into a stream that read DRINK WINE: THE WATER IS NOT CLEAN. He told me to wait while he went into the back and rummaged through some papers. He returned with a postcard of the mural. 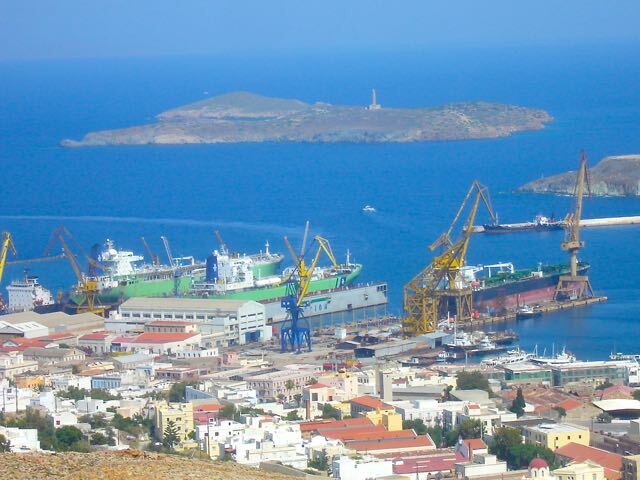 Besides being full of civil servants the city has the shipyards and hundreds of other small businesses, and a large year-round population which is supplemented by the crews of the giant tankers being repaired in the Neorion dry docks. Neorion was Greece's first major ship-building company, and began by building wooden boats to fight in the War of Independence in the 1820s. The Neorion company was founded in 1861, building steamships, as well as steam engines, boilers, pumps, heavy cannons, and starting in 1892 steel hulled ships. In 1974 Neorion built what might be called the world's first SUV, the Neorion Chicago, a luxury 4-wheel drive vehicle. They built two, of which one survives in the Technological Museum in Thessaloniki. Another Neorion creation was the Enfield 8000 Bicini, the sort of stripped down jeep-lite looking vehicle which never got beyond the first few production models. Neorion now owns the Elefsina Shipyards outside of Athens and also builds luxury yachts. One of the best forms of slow-motion entertainment is to watch as the Syros tugboats guide a giant tanker into the submerged dry-dock which then closes the gates, pumps out the seawater and lifts the ship out of the sea. Most of the other towns of Syros are like beach communities for the people from Hermoupolis to go to on hot summer days, though they do have hotels for visiting Greeks and the small number of tourists who come. The beach towns in the south are on a sort of rocky shelf with buildings going almost to the sea and architecture inspired by Junta-Period Athens, for example two and three story apartment buildings scattered among simple one story Cycladic island houses. Azolimnos is one of these, a Greek beach town of small hotels and fish tavernas a few steps from the sea, packed in August and weekends in July. The few tourists who go there come regularly because they came once 20 years ago and now they know everyone. Vari is a collection of hotels, tavernas and summer homes in the sheltered Vari Bay. There are a couple nice swimming beaches and there is a small cove called Achladi which has a really nice seafood taverna run by Nikos Bamvakousis called Axladi which were it any closer to the sea you would be in it. As it is you can feed the kefalo (fish) and the cats simultaneously without leaving your seat. One of their specialties is gouna which is sun-dried mackerel that is then grilled. Its my favorite dish on the island. Megas Yialos (photo) is a long narrow sandy beach lined with shade trees with a handful of hotels and tavernas. Poseidonia which was called Dellagracia in the Vamvarkaris song Frankosyriani, has a couple sandy beaches but is notable for the many mansions scattered around, some intact, some in the process of being restored. Finikias is a yachting center. Its the best sailboat harbor on the island and there are a couple companies based here and others that have satellite offices. Life seems to center around the taverna on the small hill overlooking the harbor. Charter sailboats that stop in Sifnos usually come to Finikias mainly because skippers don't seem to like staying in the big harbor of Hermoupolis because when the ferries come and go, their wakes bounce the sailboats up and down and against each other. Plus the sailboat section of the dock is about 3 feet from all the cafe tables so anything you do you have an audience from showering to arguing with your girlfriend. At least in Finikias you can have some privacy even if you have to anchor out in the bay to get it. 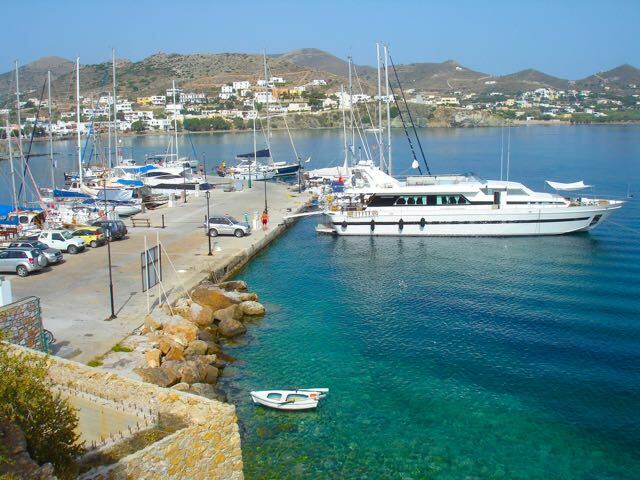 It is not the most beautiful port in the Cyclades but it is practical and after a few ouzos at one of the cafes or restaurants overlooking the harbor it starts to look like a place you could park your boat and hang out for a season or two. Nearby Red beach is not as spectacular as the Red Beaches in Santorini or near Matala, Crete but the rocky coast will give hope to snorkelers and spear-fishermen that under the beautiful blue sea there is a nice big rofos waiting to be caught, if not a few kefalo. Further down the coast is Galissas, a long sandy beach with a remote wild feel on one end and beach umbrellas and lounge chairs on the other and some tavernas, homes and rooms to rent. Overlooking it is the Hotel Dolphin Bay, the biggest resort type hotel on the island, though not too big. Northern Syros is a rocky barren place that you reach by driving up past Ano Syros, the Catholic mountain that overlooks Hermoupolis. There are marked footpaths that cover the whole island for those who want to explore its most remote beaches, churches and settlements. There is a pre-historic settlement and a cave somewhere in the north. We didn't find them but we were lazy, tired and hot since it was probably the hottest day of the summer that we chose to do our exploring. You need to go in the cooler months or early in the morning, returning when the sun is going down. There are also a number of exotiko (country) tavernas that seem like they are out in the middle of nowhere until you realize that from just about anywhere on the island you can be back in Hermoupolis in about 15 minutes. If you have ever been to an exotiko taverna its the real deal, with grilled meats, home-made wine and often dancing and singing to hired musicians, or musicians who just happened to show up for dinner with all their instruments. Once you get comfortable Syros is the kind of island that you can return to every few years and still feel like its home. 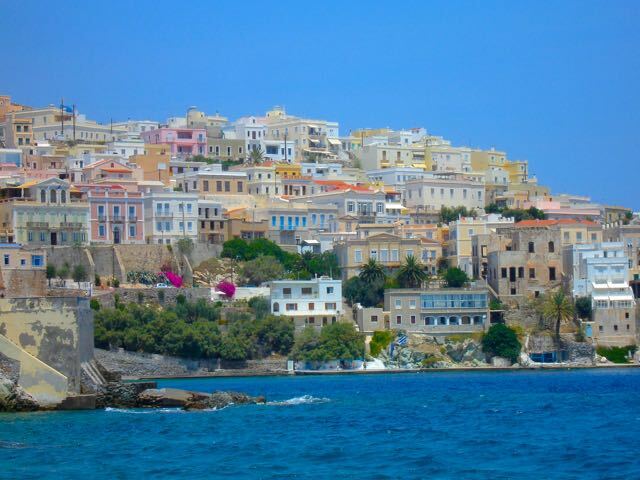 I think if I was going to live year-round on any island I would choose Syros. Though no island 'closes for the winter', there are some that can be quite desolate in the way-off season, with one or two tavernas opening whenever the owner feels like it and people spending most of their time at home, prisoners of rain, cold or boredom. 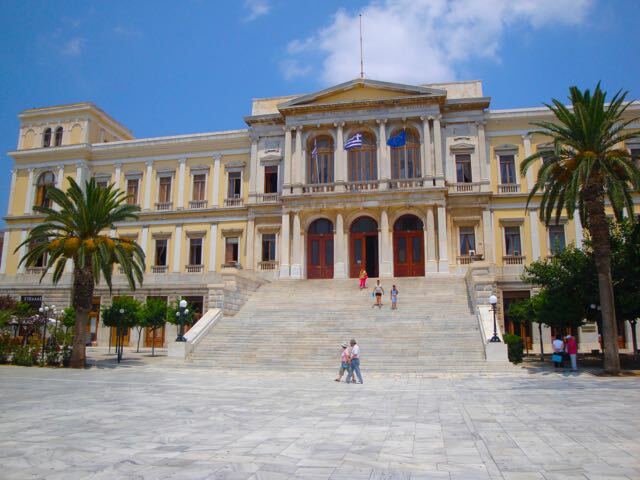 Hermoupolis is a functioning year-round city with restaurants, cafes, nightlife, shops and most importantly that daily boat to Athens being a relatively short trip if you need a real shot of city life. And if you are a traveler who wants to island-hop your way through the Cyclades and you want to visit an island that is nothing like the others, then I highly recommend Syros. You can book Syros and several islands by using my Create-an-itinerary form or by contacting any of my recommended Greek travel agencies. 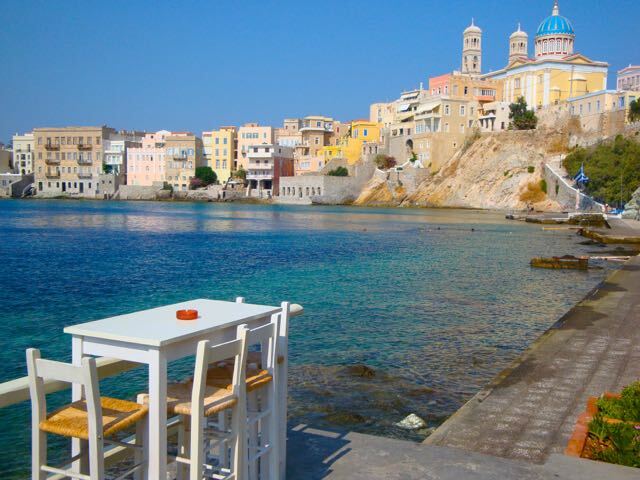 If you don't want to use a travel agency you can also Search Hotels in Syros.